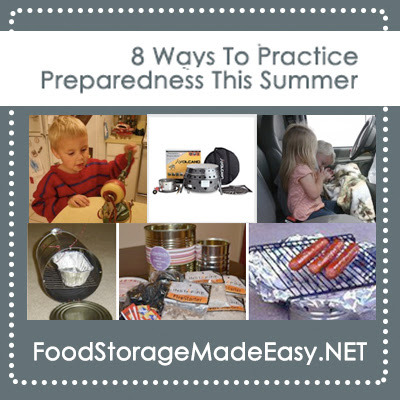 We hope you are having a great summer so far and haven’t forgotten about food storage and preparednesstoo much with all the fun going on 🙂 We actually have found summer to be a perfect time of year to practice different aspects of your preparedness and have a little fun while doing it. Here are eight ideas that you can use if you are looking to bolster your preps a little over the next few months. If you are camping with your family, grab your 72 hour kits and use those foods for meals. Practice cooking with your camping stoves, try different foods rather than sticking with hot dogs and s’mores. Use different fuels since you are cooking outdoors anyway. Use your Dutch Oven to make gourmet foods for your campout! Practice different emergency scenarios with your kids. Go over your Emergency Preparedness Plan together. You can even try our disaster kit scavenger hunt if you don’t have yours put together yet. Make some little #10 can stoves, ovens, and grills and let your kids cook something on them! Practice cooking new things and let the kids participate with you. Let the kids help you with your canning adventures. Every time you barbecue you are really practicing powerless cooking. Try getting adventurous and cooking regular foods on your grill. You can do pizza, bread, vegetables, etc. It’s a good idea to monitor your fuel consumption so that you can have a better idea of how much to store. Figure out how to use it more efficiently to conserve fuel. Summer is a great time to do your canning because your kids can be around to help. Having powerless options for canning is great in case you lose power and don’t want to lose all your meats from your freezer. Practice canning outside to keep your kitchen from getting too hot and practice powerless canning at the same time! Summer time is a great time to work on your water rotation. There are so many thing you need water for in thesummer, you might as well use your stored water rather than waste brand new water if you are planning to rotate anyway! If you are at block parties or family get togethers, you can practice preparedness and spread the word to your neighbors about being more prepared. Bring a volcano grill and build a fire or cook food. You could also use food storage foods to make your pot luck items and let people know. This is a good chance to find out if your neighborhood has a preparedness plan in place and/or to organize something if they don’t. Even a simple calling tree or group CERT class can be a great addition to any community. Road trips are a great time to evaluate your car kits while you travel. But it’s also a perfect time to talk about your preparedness plans and make a plan for what to do in the future, go over inventory lists, etc. You have your kids contained, and your spouse’s full attention. It’s a win win! It’s always a great idea to find ways to AVOID heating up your kitchen in the summer to save on A/C costs or unpleasant heat. Some of our favorite tools for doing this easily are the All-American Sun Oven and Volcano Grills. If you give any of these ideas a try, post about your experiences in the comments or over on Facebook!